The Arabic word for bread is Kubz خـُبز, derived from the verb Kabaz خـَبـَز (bake). 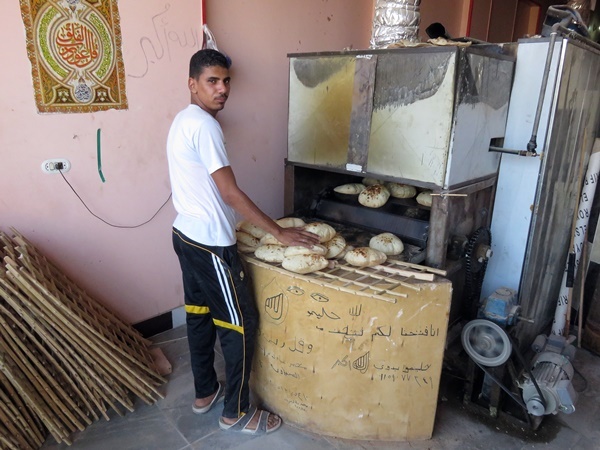 Arabs generally are not big bread eaters, but for Egyptians it's a completely different story: they eat more bread per capita than any other country in the world. Bread is so important that the Egyptian word for it is Aeesh عيش, which also means life. My Arabic teacher says that, when she was young, a Kabbaeza خـَبّا َز َة would come to the house to help her mother to make the bread that would last the household a week. Imagine, a whole day devoted just to making bread. They cook the bread in a kind of drive-thru oven: a baker puts discs of dough onto a conveyor belt at one end, and cooked bread comes out at the other end a couple of minutes later. From here, it is laid on woven wooden trays to cool. Some customers buy direct from the bakery: the rest of the bread is distributed on the wooden trays to street sellers and restaurants. Some bakers sell a variety of types of bread, for example feenw فينو (short batons of soft bread), batoon saleeh با َتون سـَليه (salted bread sticks) and koorwasoon كوروا َسون (croissants). As you can tell from the names, these types of bread were brought to Egypt by the French during their brief occupation from 1798 to 1801. Also popular is a round bread about 5cm thick called Aeesh shamsi عيش شـَمسي- sun bread. It gets its name because it is normally put out on the roof in the warmth of the sun to rise. You can buy them from street sellers and local shops, but I don't know where they come from. 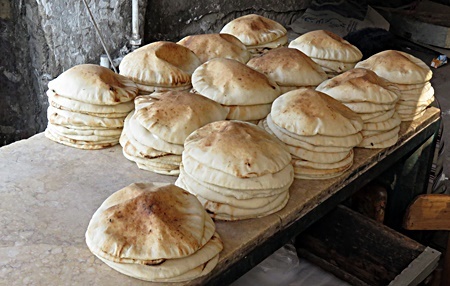 If you eat too much bread and are worried about your kirsh كـِرش (pot belly), you might like to try sinn سـِنّ (literally, gravel), which is a dry, hollow bread roll made mainly of bran. Apparently it is very popular with people who need to lose weight. Finally, I should mention ru'ae' ر ُقا َق, a thin crispy bread like a pappadom. It is not eaten on its own, but is used in cooking to make dishes like ru'aa' bil lahma mafrooma ر ُقا َق بـِل لـَحمـَة مـَفرومـَة (meat wrapped in ruqaq) or 'umm Aali أ ُمّ عـَلي - layers of ruqaq and nuts cooked in milk. You can buy big packs of dry ruqaaq wrapped in brown paper from the bakery, or frozen dough in slices from the supermarket.